When I visited Korea in 1998 the Public Affairs Officer of US Forces/Korea suggested that I read the book Battle Hymn as it was a wonderful story of how Colonel Dean E. Hess, USAF saved the lives of almost 1,000 orphans. On return home I got a copy of the book and I was truly impressed. But then I also began collecting everything I could find on the relationship of US servicemen and women and the children of Korea during the war years and, much to my consternation, I found that Hess is rarely mentioned in the early reports of that rescue pulled off on 20 December, 1950. A reporter from Airman Magazine, the publication of the U.S. Air Force, called me and asked what I knew of that rescue and I had to admit that I was suspicious of Hess’s claim of being responsible for the rescue. Then Tom Brokaw’s staff phoned me and I, by that time, was even more certain that Hess had nothing to do with the rescue. I was able to direct Brokaw’s staff to movie footage of the actual rescue that was in the US National Archives. Then I met Chaplain Russell L. Blaisdell, Colonel, USAF, Retired who was the one who actually rescued the children. He gave me a copy of his diary of that event which clearly indicated that Colonel Hess had nothing to do with the rescue. Frankly, I was shocked! I now had the evidence that one of the great “heroes” of the Korean War was a FRAUD! And, frankly, I am now doubly shocked to find out that no one seemingly gives a damn. In fact I have been called by a General in the Air Force located in the Pentagon asking me to ‘lay off” and not push this any further. I provide herewith an early statement that I prepared spelling out my charges that Colonel Dean E. Hess is a FRAUD. by George F. Drake, Ph.D. 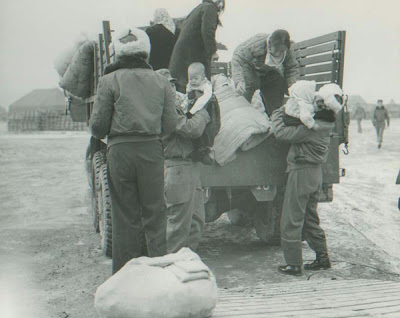 When the Chinese forces were approaching the northern edge of Seoul in December of 1950 Air Force Chaplain Russell L. Blaisdell and his Chaplain’s Assistant S/Sgt Merle Y. Strang, arranged for trucks to take 950 children and 80 orphanage staff of the Seoul Receiving Center and another smaller orphanage out of Seoul to Inchon to board an LST for escape to Pusan at the southern tip of the Korean peninsula. 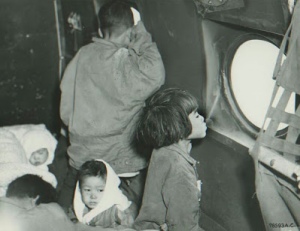 Chaplain Blaisdell was responsible for the rescue of many of these children from the streets of the devastated city in the months prior to their evacuation for Inchon. It was Blaisdell and Strang who stayed by the orphans and staff in a 35 ft. by 70 ft school building for four and a half days waiting for the ship that never arrived. It was Chaplain Blaisdell who, on a desperate trip back to Seoul, with Sgt. Strang as driver of his jeep, made arrangements for the flight of sixteen C-54s to fly the children and staff from Kimpo airport the next morning to Cheju-do Island located to the south of the Korean Peninsula. It was Blaisdell and Strang who commandeered the trucks (Blaisdell “pulled rank” to take the trucks away from another unit loading cement on a boat in Inchon harbor) necessary to transport the children, staff and 15 tons of food and belongings to Kimpo Airport on the morning of the 20th of December. Hess had nothing to do with any of this and was totally unaware of the exigencies faced by Blaisdell at every step of the way in effecting this rescue. On the 19th of December as soon as Blaisdell had arranged with Colonel T.C. Rogers, Assistant Director of Operations for the Fifth Air Force, for the flight of C-54s to arrive at Kimpo the next morning he wired Hess that he would arrive on Cheju-do Island on the 20th with the children. Hess wired back that the situation on Cheju-do was not ready for them and asked Blaisdell to delay the operation. Blaisdell responded that there was no way he would postpone the rescue flights. Other than this exchange of messages initiated by Colonel Blaisdell there was no other contact between Hess and Blaisdell regarding the rescue of the children between their last meeting in Taegu a week earlier and their meeting on Cheju-do after the rescue. Hess states in his book Battle Hymn that he desperately was trying to make arrangements for the flight of C-54s from the Combat Cargo Command. No one doubts that he was working on that task but nowhere does he clearly state that he actually made contact with anyone who made a commitment to send the planes to rescue the children. If, in fact, he did make that contact and obtained a commitment for the flight of C-54s Hess gives no indication of how he got that information to Chaplain Blaisdell so Blaisdell could get the children to the airport to meet the rescue aircraft on time. Hess is portrayed in the book Battle Hymn, the movie and in later newspaper articles as desperately calling every one he could to get a flight of planes to rescue the children. We can agree that Colonel Hess was concerned about the children but the facts show that it was Blaisdell and not Hess who was successful in making contact with the Combat Cargo Command to bring in the flight of C-54s to rescue the children. In other words Colonel Hess actually had nothing to do with the successful rescue of the children in the famous Kiddy Car Airlift. Accordingly it is incomprehensible how Hess could successfully claim over the years to be the one who rescued the children. Once the children were located at Cheju-do Colonel Hess was in regular contact with the orphanage and provided extensive assistance. Besides the involvement of Hess and his crew many tons of material aid and tens of thousands of dollars were coming from persons in the U.S. and from military units in Korea and Japan to help the orphans. Most of this was as a result of Hal Boyle’s Associated Press article on the rescue that appeared in newspapers throughout the United States. Colonel Blaisdell went to Cheju-do with an air shipment of aid packages on several occasions but Colonel Hess was there on a regular basis doing all he could for the welfare of the children. Hess’s first inference that he was the one responsible for the rescue of the children in the Kiddy Car Airlift appeared in his autobiography Battle Hymn which was first published in 1956 almost six years after the actual air lift. On the book jacket one reads “But Colonel Hess will perhaps be best remembered for his heroic efforts in Seoul, Korea, in 1951 [sic.] on behalf of thousands of defenseless Korean orphans about to be engulfed by the Chinese Communist armies sweeping down from the north. Tormented by the sight of these homeless doomed children in the streets of Seoul, he shepherded them to the Seoul airport where he sent out a distress call to his commander. 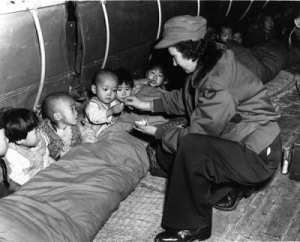 At the last minute, a Fifth Air Force airlift, later to become famous as “Operation Kiddy Car” picked up the orphans and flew them to safety on Cheju Island off the southern coast of Korea.” This statement is total fiction and part of a publisher’s campaign to sell the book as a true story. This blatant misrepresentation of the facts of the case was but the beginning of a steady flow of falsehoods. The book Battle Hymn as a grossly self serving distortion of the facts of the Kiddy Car Airlift and a poorly researched document. Had Hess actually read any of the media coverage given the Kiddy Car Airlift, which he refers to in the book, he would have been able to write a much better and more accurate account of what actually happened with regard to the airlift. The lack of accurate information in the book regarding the airlift is inexcusable since Hess, after leaving Korea, was appointed Director of Air Force Information Services and had access to everything published in the Pacific Stars & Stripes newspaper on the rescue. The errors of the book were magnified in the movie. 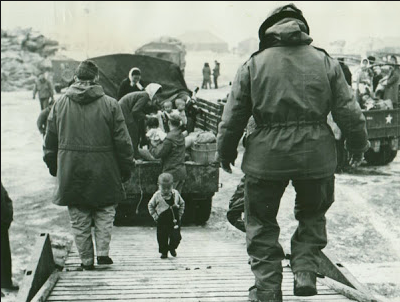 In the movie, which was presented as a true story, Hess is shown walking with the children from Inchon to Kimpo Airport. None of them walked. The movie doesn’t even mention Blaisdell and leaves the viewer believing that it was Hess who organized the rescue and was with the children during their time of trial. In the first several years after the rescue the media recognized Colonel Blaisdell as the person who successfully rescued the children and orphanage staff in the Kiddy Car Airlift but after the release of the book and movie in 1956 and 1957 no one went back to the earlier records to ascertain the truth. The accepted story from then on was that it was Colonel Hess who rescued the children. And, it seemed that Hess began to believe the distortions as truth and accepted credit for a rescue he did not organize, did not manage, tried to delay and was not even witness to. This is unconscionable as Hess had dinner one night in Los Angeles during the filming of the movie Battle Hymn with Mike Strang who had assisted Chaplain Blaisdell in the rescue. Hess asked Strang about the rescue but once knowing the truth from one of the actual heroes of that airlift he refused to help Strang get a role in the movie. Even if Hess had never read any of the articles printed in the Pacific Stars & Stripes, Colliers Magazine, Time Magazine and other publications about the rescue back in 1950, 1951, 1952 or 1953 he now had information on what really happened directly from Sgt. Strang. It seems that Colonel Hess was now a captive of his own inaccurate portrayal of the rescue as presented in his book. The media now had him as the hero, the person who walked with the children from Seoul to Inchon and back to Kimpo for the rescue. Now that the rights to the book were in the hands of movie producers Hess had lost control of the story. And the story really got out of control when the movie was promoted throughout Korea and the U.S. as a true portrayal of the Kiddy Car Airlift. The articles published in newspaper accounts about the book and film were outrageous in the amount of incorrect information that was printed. From various issues of the Pacific Stars and Stripes we quote, “Using AF C-119 aircraft, Hess gathered some 800 orphans from different sections of the country and flew them to safety”. (27 Sept. 1956) “Hess organized “Operation Kiddy Car” (12 Jan. 1957). “Battle Hymn Has Seoul Premiere…Korean waifs and ROK Air force bands teamed up to provide fanfare marking the premiere of “Battle Hymn” describing Col. Dean Hess’s heroic actions in saving trapped Korean orphans from the Chinese communists in the winter of 1950-1951.” (30 June 1957). “Air Force Col. Dean Hess, famed for his life-saving rescue flights of Korean orphans during the 1950 fighting…” (21 July 1959). The above are cited as examples of the recognition Col. Hess received for an airlift he did not organize, a rescue he did not manage and even tried to delay, and, from all evidence in his own report of the incident, he wasn’t even an eye witness to! It is obvious that the reporters following Hess’s every move in Korea used his book and the movie as their source of information on his role in the airlift. Nowhere does Hess explain that he had no contact with Colonel Blaisdell after their meeting a week prior to the evacuation of the children from Seoul, knew nothing of their wait in Inchon or return to Kimpo Airport, that he had no contact with Chaplain Blaisdell regarding their rescue other than to attempt to delay the rescue one day until he could complete arrangements in Cheju-do to receive the children. Never does Hess give credit to Blaisdell and Strang for their role in the operation. But then Hess also fails to give credit to any one else who was helping the children once they were located on Cheju-do. To read his book one would think it was his unit that was providing the bulk of the material and financial support for the orphanage. In reality the material aid coming to the Orphans’ Home of Korea as a result of Hal Boyle’s article far exceeded anything Hess and his unit raised from family and contacts in the states. Nowhere does Hess mention the tens of thousands of dollars coming to the Orphans’ Home of Korea from military units other than his own. Hess does not like to share credit with anyone. This additional distortion of the facts led to the false conclusion that Hess was the hero not only of the Kiddy Car Airlift but also in helping the children survive their first years on Cheju-do. Once the movie was released it seemed impossible for Hess to say “This is not a true portrayal of what happened.” Hess had become a captive of his own earlier mis-statement of the facts of the rescue. Recently Hess has privately, but not publicly, stated that he was upset with the way the movie distorted the story of the rescue but the truth of the matter is that his concern for that distortion of the facts did not prevent him from accepting the honors due someone else. Nowhere does Hess state “Wait a minute. This has gone too far. I want to acknowledge the role of Chaplain Blaisdell and S/Sgt Strang in the rescue of these children.” All of this is very sad in that Colonel Hess was truly concerned with the plight of the orphans and he did provide extensive aid to Whang On Soon and the Orphans Home of Korea. He did not need to steal credit for the airlift to be honored for his work on behalf of the war orphans of Korea. Hess’ role as a fighter pilot and as “Father of the Korean Air Force” truly justifies his status as a Korean War Hero. His work on behalf of the children in the Orphans Home of Korea and with other Korean War orphans justifies him being honored for his work with children but only as one of hundreds, if not thousands, of other servicemen doing the same in othe rparts of Korea. But by also taking credit for what did not belong to him, i.e., credit for the Kiddy Car Airlift, he seriously damages his own credibility. Hess, who is also characterized as “Preacher” and the “flying Parson” is an ordained minister who gave up his pulpit for the cockpit. His theft of credit for the Kiddy Car Airlift leaves one to wonder about his sense of commitment to his religious credentials. To Strang’s credit he took Blaisdell’s advise and said nothing. We have accounts of individuals receiving a Presidential Citation for saving the lives of four Korean war orphans and yet here we have a former Air Force Sgt. and his commanding officer, willing to keep quiet about their role in the rescue of over 950 orphans just to insure that Hess could maximize the income from his book and the movie about that air lift. So far as is known Hess did turn over to the orphanage all the proceeds from the book and the movie. For that he deserves credit. But Hess, by distorting his role in the airlift, denied both Colonel Russell L. Blaisdell and Sgt. Merle (Mike) Strang the credit due them for one of the most dramatic rescue operations of the Korean War. More than 50 years after the fact Blaisdell was finally honored in Korea for the rescue of the children in the Kiddy Car Airlift. Recently, at the dedication of the Korean War Children’s Memorial in Bellingham, Washington, Blaisdell received the “Four Chaplain’s Award” of the Office of the Chief of Chaplains of the U.S. Air Force for the rescue of the children in the Kiddy Car Airlift. Unfortunately, Mike Strang was not at that gathering along with Chaplain Blaisdell. He died in Milwaukee, Wisconsin in 1998 without recognition of any sort during his lifetime for his role in that rescue.